This lightened up Skinny Broccoli Salad gets a delicious crunch from the sunflower kernels and crisp broccoli, with a delicious healthy dressing made from Greek yogurt! So after my post from the other day for that amazingly decadent Chocolate Chip Cookie Cheesecake Pie, I figured a lighter recipe was in order. I love Broccoli Salad. With such a healthy main ingredient, it only seems right that it be given an equally nutritious dressing to coat it in. Replacing the mayo with plain Greek yogurt bumps up the protein, yet cuts back on the unhealthy fats and calories. Plus, it tastes just as delicious! I hope y’all have a lovely weekend! And if you’re grilling, try whipping up some Skinny Broccoli Salad to go with your meal. Enjoy! 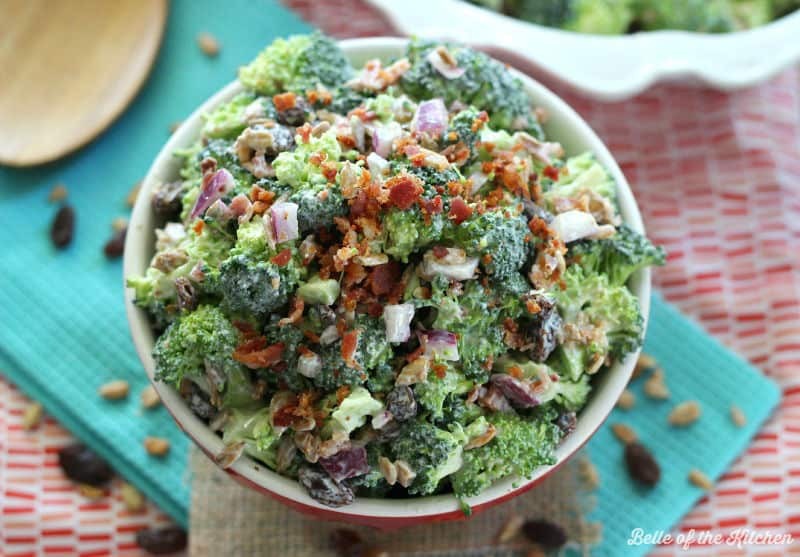 Combine broccoli, sunflower kernels, raisins, and bacon in a large bowl. Set aside. Stir together Greek yogurt, sugar, and vinegar in a small bowl. Pour over the top of broccoli mixture and stir evenly to coat. Tastes great when served immediately. If you need to refrigerate it for later, you may want to prepare a bit more of the dressing to add in case it gets a little dry. 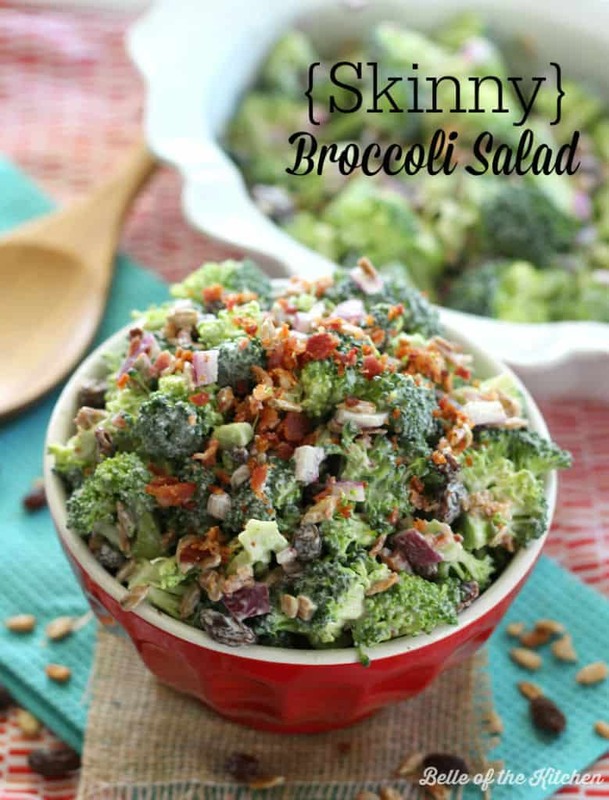 I love broccoli salad too but steer away from it because it’s on the more indulgent side but I so love this! I’ve gotta try that vinegar + yogurt combo soon! 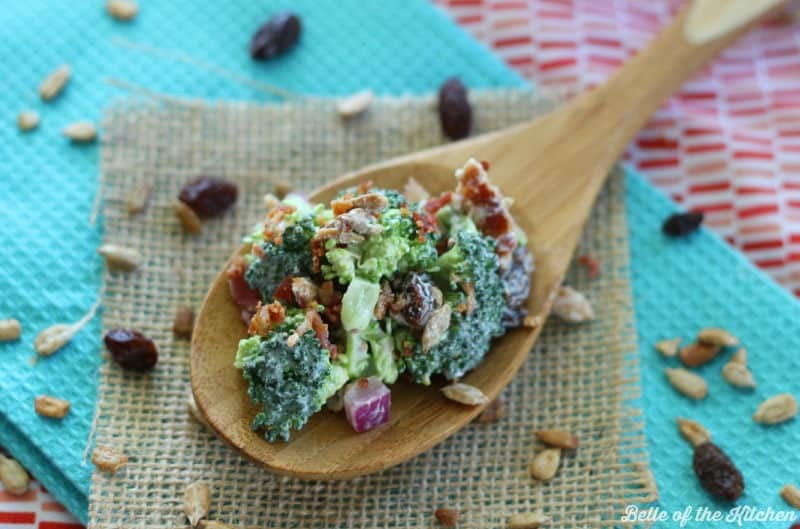 I love broccoli salad, it works amazingly with so many dishes! 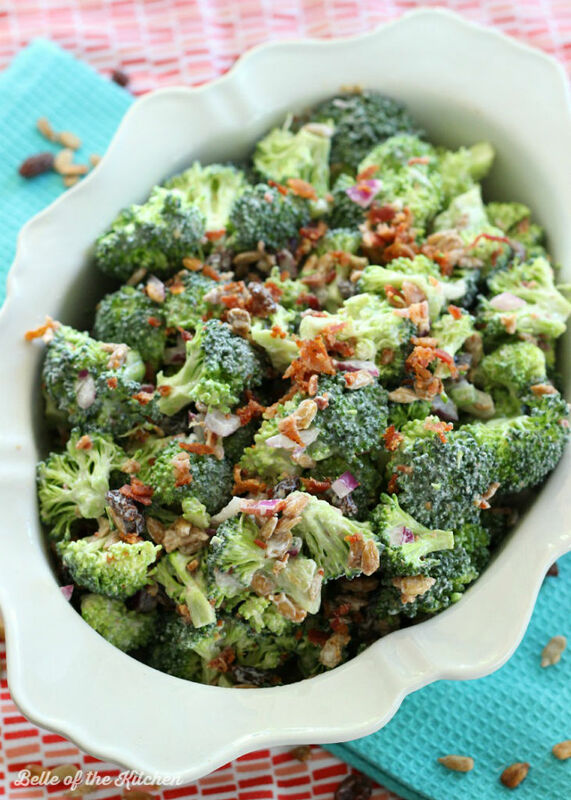 What a great broccoli recipe for a summer barbecue! 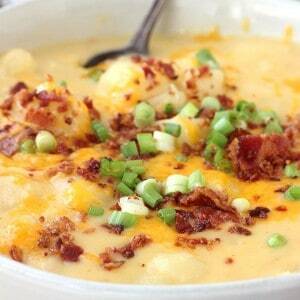 Adding bacon crumbles really takes the flavor up another level. I always make a big broccoli salad for a BBQ and it goes down very well. Such a good veggie boost. I love broccoli! 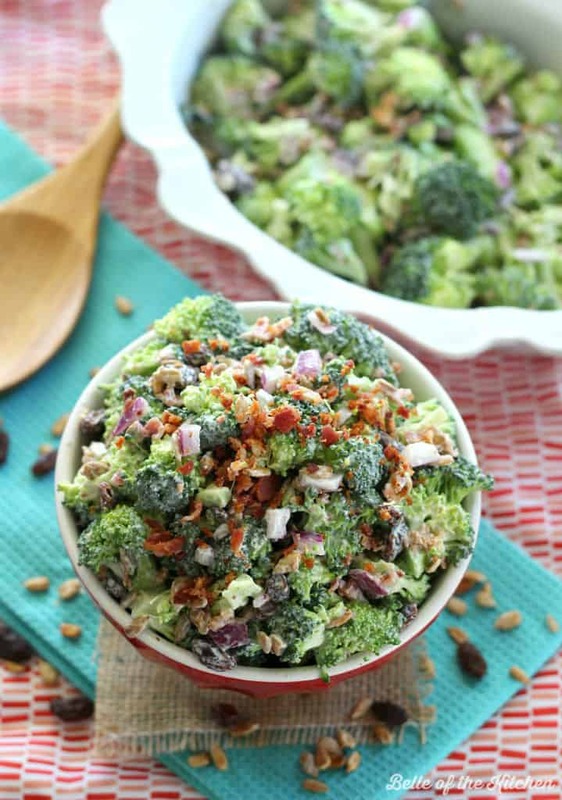 This broccoli salad looks like the perfect side dish on any meal! Can’t wait to try this recipe! 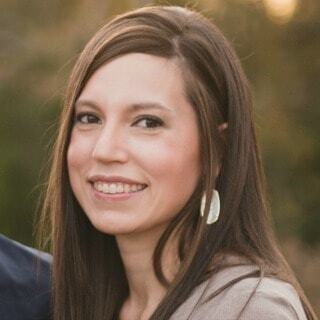 Hi Allison, I plugged it into MyFitness Pal and got about 134 calories for five servings. I have made this salad for years using the traditional recipe (which uses mayo instead of yogurt) and this was just OK for me. The greek yogurt creates a ‘dry’ sensation in your mouth that the traditional recipe made with mayo does not. I think what I will do moving forward is use 1/4 c greek yogurt and 1/4 c olive oil mayo to balance out the health benefits and to preserve the creamy texture. 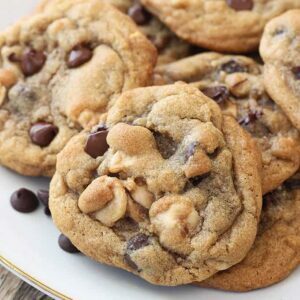 Thank you for sharing this recipe & your idea. Thanks for this reco! My husband distrusts any “healthy” recipe makeover, so I tried this 50/50 mix of olive oil mayo & plain 0% greek yogurt and it tastes delicious. This will be my go-to from now on! Yay Katie!! So glad to hear you’re enjoying it! Hi Lea! 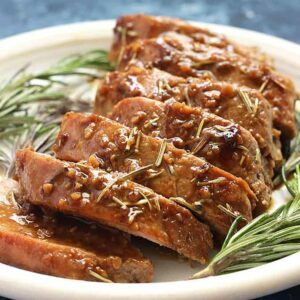 Apple cider vinegar would work fine here, it would just give it a little more zing! Hope it worked out for you! I made this with craisins (because i have a huge bag from costco! ), Splenda and turkey bacon! So good! Sunflower seeds would have been a great addition! Awesome! Glad to hear you enjoyed it, Jennifer! 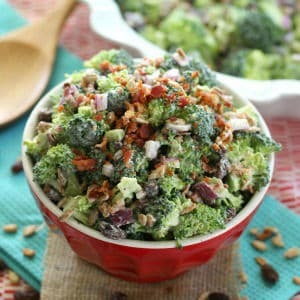 I love broccoli salad and your recipie would be a great addition to my skinny eating plan. My question is, what is the amount of your serving size. One cup,1/2 cup, I didn’t see any serving size or the stats on your serving size. Thank you for your recipie. HI Susan! That’s a great question. I would say 1/2 cup would be about the correct serving size. Unfortunately I didn’t measure it all out to see how many servings one recipe makes. 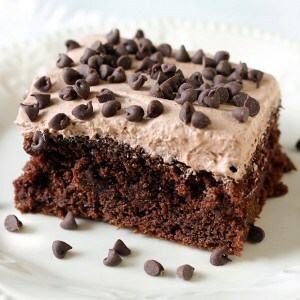 The next time I make this I will for sure do that and update the recipe. I would think it would make around 5 servings, each 1/2 a cup, if I were to estimate!